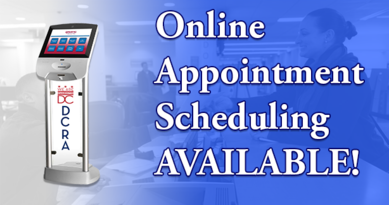 In case you missed it, last week DCRA launched its online appointment scheduling service. With this new feature you can make an appointment from home on a computer or on-the-go before visiting DCRA from your smartphone. Once checked in at DCRA, you will receive notifications on where you are in queue and when your ticket has been called. Walk-in customers will also have the option to opt-in to receive customer notifications through SMS text messaging. Reduce unnecessary waiting times. Reserve an appointment online today at dcra.dc.gov/onlineappt.